Starting my garden preps. Planted assorted lettucoi in the warmest part of Section 1. Put covers over sections 1 and 2. I’m going to scratch in some dolomite limestone, to see if I can get more calcium available to the tomatoes, et al. Started two racks of seeds. First one is mostly tomatoes: Crimson Cushion, Marglobe, and Red Cherry, with one row of Sugar Pumpkin. Second one is old squash seeds from last year: 8-ball, Delicata, and Buttercup, most of which aren’t in at the seedlers yet. If they don’t sprout by the time the tomatoes do, maybe this years will be available. Also started one of the shallow windowsill style containers with radishes for MJ. Moved the containers into position, and started filling them with the remnants of the Municipal Compost. I’ll be topping them off with potting soil, but there’s no rush. I won’t be putting anything out for another month. Also moving all the downed leaves that I haven’t done anything with over to the SE corner, where I’ll cover them with the soil I dumped out of last year’s containers. I’ll let that rest until Spring ’15 before I re-use it — 18 months should be a reasonable rest. On the south side, the hops are already showing their heads. Each place I planted one, now has six or eight new stalks. I might not have to buy any this year. Section 1: Lettuce and spinach and chard (oh, my). Plus some early peas. I”m dividing it into four or six sections and will plant one section every month. Section 3: Brassicae. No kale. Maybe leeks. Maybe beans. Maybe Santa Maria beans. Section 4: Permanently in strawberries and asparagus. I’m taking out the blueberries. They want acid soil, and the rest don’t. There’s some asparagus at the N end of Section 1, which I may try to dig up in the Fall and transplant here. Or not. Containers: Tomatoes. Maybe some Asian beans. Ground Cover: The not-officially-a-garden area that has some ornamental something or others. Last year I put pumpkins there, and got a couple of big ones. This year I’m going for smaller pumpkins, as well as buttercup squash. With more refined data, the search for MH370 has moved northeast by 700nm, and has sighted new debris. 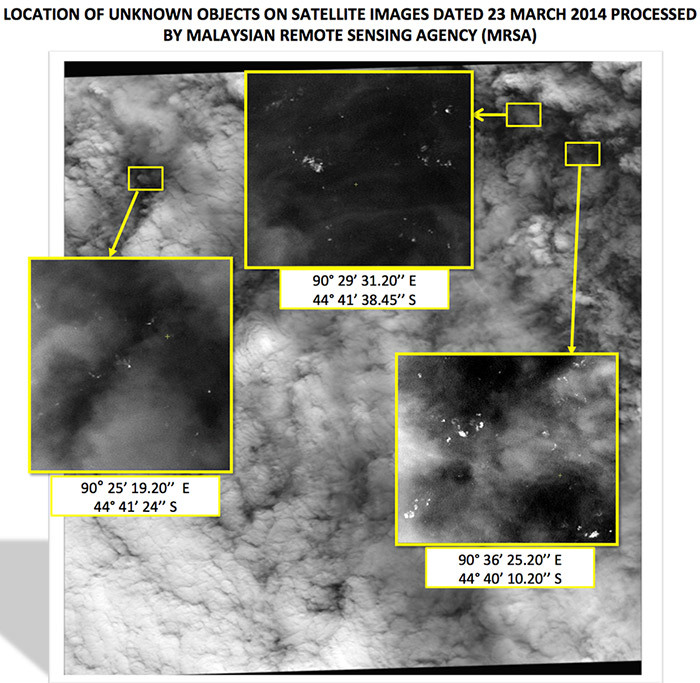 The Malaysian MoT has said that ocean drift means the debris sighted “could still be consistent with” the earlier debris fields. That’s not particularly credible, given the source and the fact that the search has been shifting to the SE to track the currents. So, what does this mean for the Southern Ocean? It means that in any two or three areas, chosen more or less at random (random from a selection of the water standpoint, not geolocation), you can expect to find upwards of 500 pieces of flotsam that are visible from orbit. Before voting on accession, Ukraine demanded from Russia, the USA, France and the United Kingdom a written statement that these powers undertook to extend the security guarantees to Ukraine. Instead security assurances to Ukraine (Ukraine published the documents as guarantees given to Ukraine), given on 5 December 1994 at a formal ceremony in Budapest (known as the Budapest Memorandum on Security Assurances), may be summarized as follows: Russia, the UK and the USA undertake to respect Ukraine’s borders in accordance with the principles of the 1975 CSCE Final Act, to abstain from the use or threat of force against Ukraine, to support Ukraine where an attempt is made to place pressure on it by economic coercion, and to bring any incident of aggression by a nuclear power before the UN Security Council. Got that? No guarantees from anyone. Assurances that aggressive acts would be brought to the attention of the UN. They gave up their nuclear weapons and got promises in return, promises that (for good geopolitical reasons, as we’ll see in a later essay) have turned out to be empty. What lessons are to be learned from this? The big one (other than the usual that diplomats lie, and countries don’t keep their word) is that if you aren’t a nuclear power, you don’t get no respect. If UA had kept even 10% of the almost 3000 warheads under their control, scattered amongst the various delivery systems, do you think that Russian troops would be on the ground in Crimea today, with 50,000 of them massing on the UA’s eastern border? Of course not. The world is watching. And some countries are watching more closely than others. What lessons have North Korea and Pakistan and India and Israel drawn from this? Don’t give up your nukes. Ever. What lessons has Iran, and any other aspirant, drawn from this? If you don’t have a force in being, you get invaded. I’d say that, whatever the ultimate resolution, one of the outcomes of the Crimea Crisis — perhaps soon to be the Ukraine Crisis, perhaps with the possibility of becoming the next European War — is that the cause of global non-proliferation has been set back fifty years. 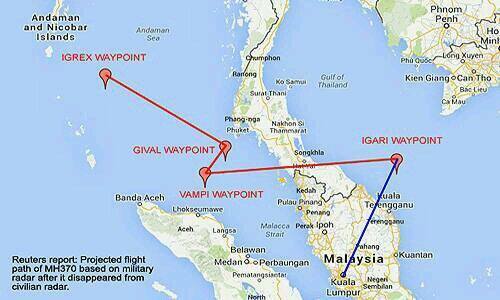 1. the communications shutdown and departure from planned flight path at waypoint IGARI. 3. the subsequent turn south. UPDATE (I’m backtracking to include this here because I don’t think it needs its own entry): We shouldn’t be too hard on Malaysia for its lack of forthrightness with the press and the public. As an Australian defence official said, somewhat plaintively, “It’s just a little country.” Yes, it sprawls over the South China Sea, but its government is one of those post-colonial dens of bureaucracy and administrative rigidity so common outside the first world. It doesn’t have enough of an educated elite, in enough of the right places, to handle an international circus like the one that descended on it two weeks ago, let alone deal with a major accident investigation, terrorist investigation, and a search and rescue mission that covered a third of the globe. Yes, it could (and did) ask for help from a lot of people, but I suspect it’s not sophisticated enough to even use the help properly. There remain many question before we can judge what the most likely chain of events was. One question is, if the crew was incapacitated by a fire or something similar, why did the aircraft return to waypoint navigation north of Sumatra? I can see a pilot dialing in a preplanned emergency airfield. I can’t see the system overflying that point and making two 90+ degree turns at waypoints if the pilot were incapacitated. Another question, if it was headed northwest, via airways, why did it turn due south? Given the time and place, this strikes me as a suicide move. A capable pilot, most likely (but not certainly) the cockpit crew, flew the route indicated, set the autopilot and….then….what? I don’t think we’ll ever know. If we find wreckage, all that will do is confirm the crash location — at sea. Our chances of finding the black box are exceedingly slim, and I doubt it will tell us anything. The cockpit recorder only runs for two hours before recycling. I suspect that tape holds two hours of silence, followed by the stall warning horn. My worst fear is that it will contain two hours of the sound of passengers pounding on the cockpit door. Someday, future archaeologists will puzzle over these family-associated ceremonial sites. If it’s liquid, it’s fair game for oatmeal, amirite? Earlier, MJ had made some cream of asparagus soup. It used home-made chicken broth, half and half, and chunks of asparagus. I believe the original recipe called for taking a blender stick to it, but we liked it just as it was. Next day, I sneaked into the fridge and liberated half a cup of the liquid (a couple chunks of asparagus came along for the ride), and topped it off with another half-cup of commercial beef broth. I used beef broth because it needed to stand up to the asparagus flavor. I left out any salt because the soup itself had a certain saltiness. Setup: 1/3 cup of stone ground rolled oats, two dinner teaspoons of potato flakes, a half-cup of beef broth and a half-cup of cream of asparagus soup, salt only if you need it. Cook for 10 minutes or so, depending on the exact style of oats. Add the potato when you take it off the stove.. Results: Pretty good, if you like asparagus. As with the soup, it could stand a handful of crunchy bacon sprinkled on it. Yes, the Malaysian government, et al. have been withholding information. According to a BBC report (that no-one else seems to have picked up on yet), we do have hourly pings from Inmarsat, and they show the aircraft flying more or less due south. The theory now is, essentially, that the aircraft turned west after its last waypoint, flew to the vicinity of Grand Nicobar Island (that small dot just off the northernmost point of Sumatra), and turned left. Back to the map (originally from a contributor to the blog Luchtzak Aviation, thanks Luke). Flying due north or due south at this point does us a favor from a geometry standpoint. Rather than crossing the Inmarsat arcs at an angle, the signal would sit on the same arc for a while. I don’t have the tools or the time to mark up this map, but you can imagine from looking at the one arc we have, how successive pings would tend to stay on the same arc. It gets better. The aircraft was north of the equator, and so a southerly track would stay on the arc longer, as it passed abeam of the satellite position. Also note that a southerly track from Grand Nicobar (nothing significant about the island, it’s just a good reference) would hit fuel depletion at about the same time as the last detected ping. A northerly track would not, and would require that the aircraft would have to do some maneuver that would have it on the northern arc at fuel depletion — that maneuver would be apparent by the fact that it crossed different ping arcs. So, the theory that best fits all the facts right now is that the aircraft shut down its communications, flew via waypoints to somewhere NW of Sumatra, turned south, and flew until it ran out of fuel. I’m keeping the title for continuity’s sake, even though there’s not a lot to indicate a hijacking of any kind. Here’s the latest “Startlingly Simple” theory — fire, smoke, crew turns back to an emergency airfield and then are overcome. It’s been criticised because the radar track shows the aircraft hitting waypoints, which means the autopilot was still on. What would it take for it to be true? 1. Less than total electrical failure. I have no idea where the ACARS and transponder equipment (or cabling is). Could a fire destroy those and not the autopilot? 2. Misidentification of the radar track. Originally, they weren’t sure it was MH370, but then decided, on no known evidence, that it was. If it was not MH370, the fact that it was hitting waypoints doesn’t matter. 3. Misidentification of the Inmarsat pings. Not sure how likely this is. We are using the satellite signal for something it wasn’t designed for. Could the ID’s be mixed up? Digits transposed on data entry? Angle data be off due to satellite-aircraft geometry? There’s a report out of the Maldives of a low flying jet. I’m not sure the Times of India, quoting a Maldivian news website, quoting a fisherman, makes for a reliable source. The time is close to the Inmarsat contact, but the location is way off. It is, however, more or less directly west of the airfield at Pulau Langkawi, and the last known location of MH370 just by a couple thousand miles. UPDATE: Maldives AF denies the story. I worked there for almost a decade, and enjoyed every minute of it. This view shows that it’s really just one, three-mile-long single-corridor building, folded in on itself like a big concrete five-ring protein. Make it five stories high, with two basements (and a mezzanine basement), and you have over 17 miles of corridor, any part of which is accessible from any other part in about ten minutes of brisk walking. The rings are lettered A-E from the inside out. I worked on the first floor of D-ring, just inside upper right hand face of the pentagon shape. Daytimes, I’d ride the bus, and come in through the entrance on the lower right side. Night shifts would see me out in the wilds of North Parking, walking through the dark and cold (or dark and mosquitos) the half-mile to an obscure entrance just off the left hand side of the apex of the pentagon. The 9/11 airliner hit the lower left side, next to the modernistic parking lot. The repairs were so good, you can’t tell from the rooflines where it was. The inner park area is planted with grass and sixty-year-old trees, and is a very pleasant spot to take a break and sit on one of the benches. It’s called ground zero, because we figured that’s where the first Soviet warhead would hit. 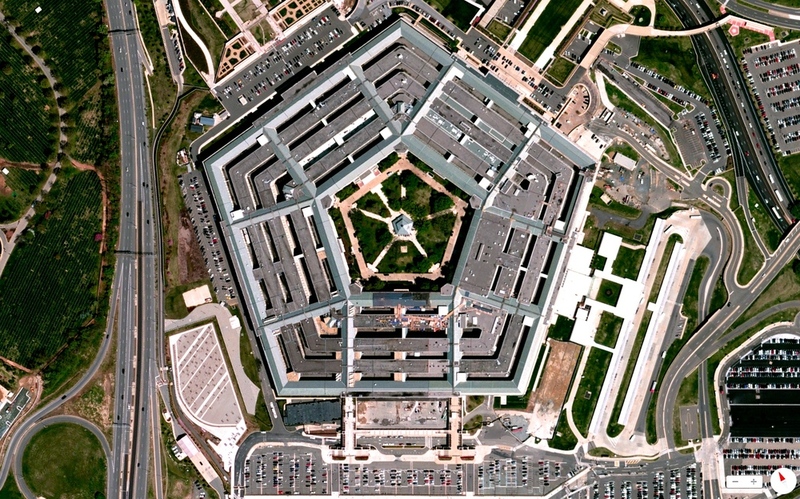 And the little pentagon-shaped building inside the pentagon-shaped park inside The Pentagon? The one at the exact center of ground zero? 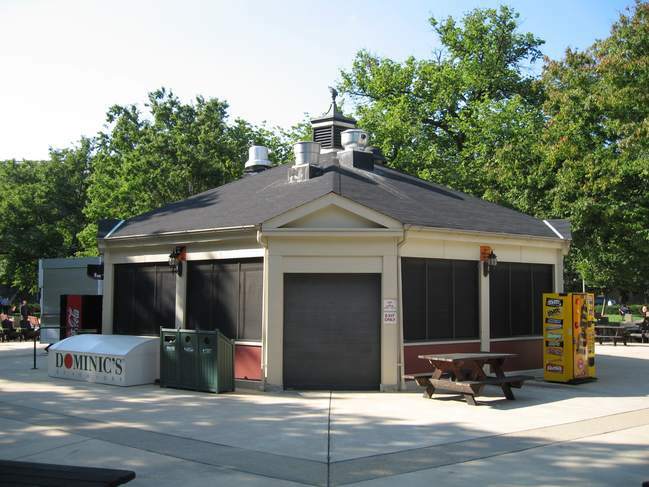 That’s a hamburger stand. This is from a contributor to the blog Luchtzak Aviation. Not as good as Aviation Herald for hard news, but it did have this map. If all reports are accurate, a big if, the aircraft was last located in the vicinity of the intersection of those two curves. Both India and Pakistan have denied that the aircraft showed on their radars, and said that if it had — a skin paint with no transponder — it would have been treated as hostile. But the major defenses of India and Pakistan are against each other, and I would not be surprised if the Indian radar coverage looking south from Bangladesh was spotty and poorly monitored. As for the India/China border, India is looking north, and as far as I know, we have yet to hear from China (NSA might know, depending on how many assets they can spare from monitoring Congress). US officials are reported to believe that the aircraft crashed into the Indian Ocean somewhere on the southern track. That’s a technical possibility, but it’s logically inconsistent with a well-planned highjack that was last detected flying north. In order to reach the IO portion of the track, without being re-detected by Malaysian or Indonesian radar, the aircraft would have had to fly northabout of Bandar Aceh and then turn south. Unless they have classified data, like sonar of the crash impact, or DSP satellite IR detection, I’d be inclined to discount it on logical grounds. We still don’t have an error band on that ping. Is the ‘corridor’ 50 or 500 miles wide? And I have yet to see any reporting on additional pings. You’d expect at least one per hour, and if we have even one more ping it would be immensely helpful. So far, we have zero information on the “terrorist” side of the equation. And so, as soon as I write a post pooh-pooing the terrorist threat from stolen passports, it turns out the plane was hijacked by….someone. As of today (Saturday morning), Malaysia is still saying it might not be a hijacking, but my definition of that term includes the crew absconding with the aircraft, so it’s a hijack. Based on the news announcement in Aviation Herald, INMARSAT has tracked the ‘pings’ from their system to two ‘corridors’, one in the Northern Hemisphere, and one in the Southern. What we have is what I think the navigators call a rhumb line, based on time delay of the receipt of the signal by a single satellite. That’s why they can’t tell which hemisphere the plane was in, but given that they were hitting waypoints headed north, they’re probably in the northern ‘corridor’. If they’d had an additional satellite in view, they’d be able to see where the two lines crossed. However, we do have a second rhumb line — the flight time to the last location. Here’s an earlier WaPo map, before the ‘corridors’ news release, showing how far the plane could have flown from the last point of contact. Now, the plane broke contact at 17:22Z (01:22L), halfway between Malaysia and Viet-Nam. At that point it had about seven hours of fuel remaining, depending on flight regime. The last skin track, over the Andaman, was an hour later, at 18:15Z (02:15L), headed north. The final INMARSAT contact was 00:11Z Mar 8th (08:11L), or six hours later, which would have been very close to the fuel exhaustion time, and 6/7ths of the way to the edge of this map. That puts them in the nearer -stan’s. If they landed anywhere short of that, they would have to have left the electronics on for a while, which is unlikely. I just have trouble believing they flew across India and Pakistan undetected. The best ongoing reporting on the search for the missing aircraft is from the website Aviation Herald. One of the interesting side notes is the case of the stolen passports — two Iranian men used stolen passports to board the plane enroute to the Netherlands via Beijing. There is no evidence that they were terrorists. In fact, they appear to be freedom-seekers fleeing an oppressive government. It is “much easier to get a stolen passport than most people think”. Some 10,000 passports are lost or stolen every year in Thailand alone. Perhaps a third of the people who board aircraft around the world, do so without their passports being checked against the Interpol stolen passport database. So far as I know, no airliner in the last, say, five years, has been hijacked, blown up, or otherwise interfered with by terrorists using fake passports. This makes me ask the Fermi question, about alien intelligences: “Where are they?” If it’s so easy to do, where are the tens, hundreds, nay, thousands, of sweaty jihadistas who want to blow up airplanes as a political statement? No, they don’t have a very good chance of boarding a US-bound flight, because we do 100% checking, but that wouldn’t keep them from attacking aircraft of friendly countries, or aircraft enroute to friendly countries. Could it be that the threat is not nearly as high as DHS/TSA wants us to believe? That they are pumping up the threat just so they can keep us in line and their budgets growing? Surely not. More experimenting with dashi (だし, 出汁 ), the seaweed/bonito broth used in most Japanese cooking. The symbol (出汁) for dashi is a combination of two kanji: 出, which looks like two stacked mountain symbols, means to go out, or departure (I’m leaving for over the mountains), while the 汁 symbol, which looks like it’s saying “water for ten”, means soup. So, soup you eat before going out. I noticed that while all the dashi recipes have you remove the bonito flakes, to give a clear broth, there’s lots of uses that don’t require that. Since limpid is not a word one usually associates with oatmeal, I decided to add the bonito to the oatmeal, instead of to the dashi. Setup: 1/3 cup of stone ground rolled oats, one cup of water from a quart jug in which a slab of kombu seaweed has been soaking overnight, two fat pinches of bonito flakes, salt. Cook for 10 minutes or so, depending on the exact style of oats. Add the bonito about three minutes before you take it off the stove. Results: Very good. Mild-tasting, with just enough fish flavor to offset the bland. You can spice it up with a drop or two of soy sauce, but be very sparing.